Meet graduate and professional students. Explore campus. Enjoy lunch. Experience seasonal beauty. Exercise can improve the ability to learn and remember, along with being a method to decrease stress levels. Explore the Cornell campus, get outside and meet other graduate students. Wear walking shoes and dress for the weather. 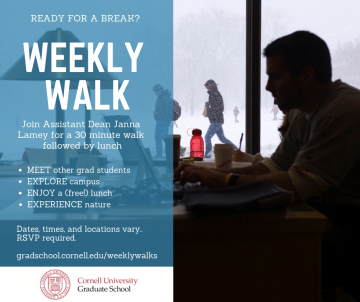 Join Assistant Dean Janna Lamey for a 30 minute walk followed by lunch. Weekly walks will meet at the Big Red Barn at 12:00 pm. Sign up below.